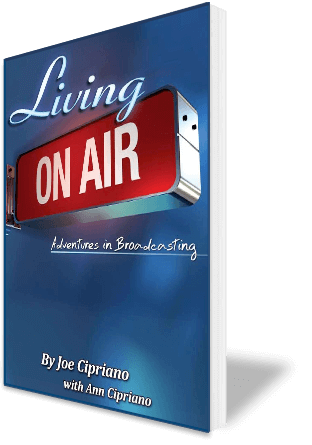 Living On Air takes you on a charming and funny adventure from small town radio to network television, the Emmys, Grammys, game shows and more. Come along on a heart-warming, humorous and unpredictable roller coaster ride filled with tips on how to make your own voice-over career dream come true. Purchase your signed paperback copy here! When you think about voices that stick in your head, names like Joe Cipriano come to mind. Joe’s energy, unique style, and recognizable voice bring products to life. And take it from me, no one says Sunday at 8/7 Central better than Joe Cipriano! Only one voice was truly synonymous with Fox’s groundbreaking comedies like Married with Children, The Simpsons and In Living Color and that voice belonged to Joe Cipriano. His distinctive style was the perfect complement to the fresh, youthful, alternative and outrageous attitude that came to define the fourth network. Joe Cipriano has been our guy in the booth for over 14 years on shows like the Emmys, Grammys, Blockbuster Awards and more. We’ve been through a lot together in doing live television, and his stories in this book are funny, charming and a great inside look into the challenges and the incredible fun that we’ve had along the way. Joe’s the best!!! People who watch my show, Iron Chef America, hear my friend Joe Cipriano whenever I speak. Joe is my voice man!! His book is filled with great stories. It’s a funny, warm and entertaining read. I got to know Joe Cipriano during the creation of the Don LaFontaine Voice Over Lab at the SAG Foundation. Joe has a knack for gathering people together for a worthy cause and Joe brought them in, in droves. His energy and his commitment to making the Lab a reality was impressive. His book is filled with the same energy, along with funny and endearing stories about his life and remarkable career in voice over.